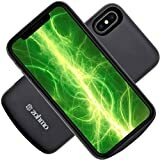 We can’t state conclusively that the Zohmo iPhone X Battery Case is the slimmest iPhone Cx battery case in the world, as the company claims. That said, it’s definitely the thinnest one we’ve come across, and yet it still doubles your battery life. This slick case packs a 3,000 mAh battery that will double your iPhone X’s battery life. It also has a built-in Lightning port instead of a microUSB port like some iPhone battery cases, so you don’t have to worry about carrying a separate charger. CHARGE ON THE GO: Few things are more frustrating than being out and realizing your phone is about to die. Whether you need battery juice for important things like business and interaction or even less important things like checking your Instagram, it is incredibly annoying when we can’t just charge up our phones without having to carry around a cord charger and finding an outlet. With our portable power bank, you can recharge your phone anytime, anywhere, for a full charge within 90 minutes. EXTEND BATTERY LIFE: Our high speed battery case is comprised of a 3000 mAh lithium polymer battery which not only quickly boosts your iPhone’s battery life, but guarantees an additional fourteen hours of talk time or ten hours of web browsing. No more setting your phone on “battery saving mode” or closing out tasks in hopes to buy you a few extra minutes. With our rechargeable battery pack, you will experience extensive phone use. SOPHISTICATION AT YOUR FINGERTIPS: Many of the lithium phone charger packs are bulky and unattractive. There is no reason your chargeable phone case can’t be functional, protective, and smooth. The Zohmo travel battery pack isn’t just multifunctional and innovational; it looks good and feels good in your hand. After all, your cell phone is one of those things you have on you at all times. You want it to be ergonomically perfect, and that’s what we set out to do when we created this product. ONE YEAR SATISFACTION GUARANTEE: Our shatterproof, durable product is built to withstand what life has to throw at you (or what you have to throw at life). We understand mistakes happen, but we are so sure in the quality of our product, we have a one year money-back guarantee. If you don’t like your Zohmo Battery Case Charger or there’s a malfunction, return it for a full refund or a replacement. It’s important to us that you are just as stoked about our iphone’s power bank protector case as us.